Consumer product manufacturers and retailers looking to expand to an international audience must use professional translation services. These services provide the cultural and linguistic specificity required when marketing to cross-cultural target markets. Reaching a global market requires an understanding of cultural differences, as well as an impeccable knowledge of the target language. Whether translating product packaging, product manuals, packaging inserts or other documents, it is imperative that you partner with a translation company with the acumen to translate both your message and your brand. This is precisely why you want to use ITC. Our team of professional and specialized linguists provide clear and concise translations at an affordable cost and understand the importance of accuracy and having the significance of cultural nuances. 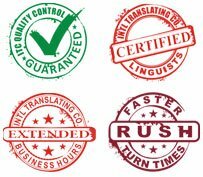 We pride ourselves on providing translation services that are delivered quickly and are easy to order, making your translation experience simple and convenient.